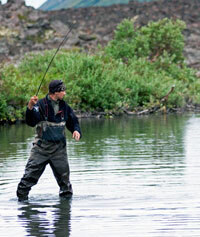 Alaska is a world-renowned sport fishing destination. In fact, in this land of 3,000 rivers, 3 million lakes and 6,640 miles of coastline, a sport angler’s greatest challenge can just be deciding where to go. Adding to this challenge is the reality that Alaska is enormous; fishing it all would require one to cast across a million acres of streams, lakes and water-lapped shorelines every day for a full year. Think of it as the old anglers’ quandary – so many fish, so little time. The mission of the Division of Sport Fish is to protect, maintain and improve these valuable sport fisheries, by overseeing Alaska’s wide range of sport fisheries, as well as many personal use fisheries. Established in the territorial days of 1951, the division’s creation coincided with the passage of the Dingell-Johnson Act, which established an excise tax on items such as fishing tackle, and motor boat fuel. These Sport Fish Restoration funds are then distributed back to the states to conduct activities such as sport fisheries management, research, and restoration. Our biologists, researchers, and technicians are in the field 12 months per year, monitoring and managing a wide range of fish species, from Alaska’s Southeast Panhandle to the high Arctic. Look for us when you’re out enjoying your day on the water. But check in here first. We’ll strive to have the answers to your questions, and we can help you get settled on where to start your next fishing adventure.